One of my favorite challenges this week! The dollar store! Have you seen Dollar Store Crafts? 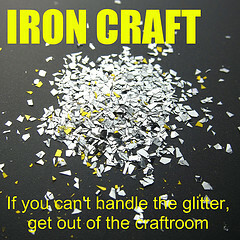 It's how I found out about the Iron Craft Challenges. 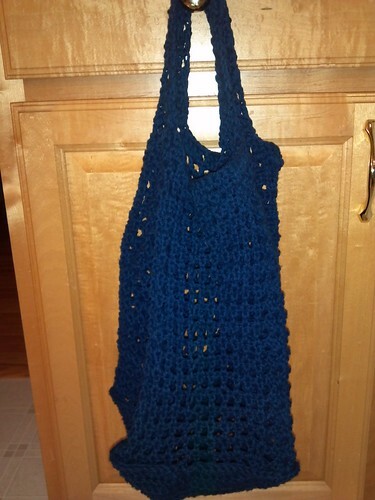 A few weeks ago, I'd stopped by the Dollar Store to get some yarn to make my friend's grandson a bag. I'd made her one and he ended up confiscating it, but it was pink and purple, so she asked me to make one in colors that are better suited for a boy. I was having problems finding colors that were for a boy. For some reason all the cotton yarns tend to be pastels and really girly colors. But I was as the dollar store and saw that they had some navy, so I picked up a couple balls. When this craft challenge came up, I thought I would make the bag. But, the more I thought about it, the more I questioned if it was really in the spirit of the challenge. It's not all that much of a challenge to go to the Dollar Store buy a single craft supply and make something with it. So, I put that project on hold and decided to make another trip back to the Dollar Store. I was at a friend's house a few months ago and she had this cool weekly calendar on her wall, where she used a dry erase marker to write the family's events. I really liked the idea and admired it. She said the hardest part of the whole thing was finding a frame that had that many opennings. Using this as inspiration, I decided to create a weekly calendar for my family. When I was at the dollar store though I ran into a problem, there weren't enough of the frames that I liked (and that were suitable). So, I decided to settle on doing five for now and I'll add another one for the weekend later. I'll just have to be very careful when I go back to make sure I get one exactly like the ones I've already bought. It's amazing how much those frames look alike! So, I bought 5 frames that were the same and had square sides. Then I took my hot glue gun and just glued them together in the configuration I wanted. Picking the configuration was the hardest part for me, I'm not good at layouts. After that I found some printable scrapbook paper and used it for a background to the days of the week in my word processor and printed out a rectangle a bit bigger than my frames. I cut the paper to size and put it in. If I were to do this again, I'd use a little less hot glue. Some seeped through the front and is visable. IC 3 - Catalog Creation - Jewelry tree. About 6 or 7 years ago, I saw these whimsical jewelry holders at a craft show. They were pretty simple, so I didn't purchase one at the time, figuring that I'd make one for my daughter. I bought the stuff to make it, painted it, glued it together and then waited to get some holes drilled so I could get the cup hooks in. Up until last week, it was still waiting. Furthermore, I now have TWO daughters and was in need of a second one. So I made another. Paint the candlestick and the wooden ball. Glue the ball onto the cup for the candlestick. Allow the glue to dry well. I used a wood glue for this. Mark where you want the hooks to be. I recommend looking at it from the top and the sides to make sure you get them spaced evenly. I placed 4 on the ball and 2 on the candle cup in between two on the ball I would've done 4 on the candle cup, but ran out of hooks. Using the drill and a bit that is just smaller than the hooks, drill pilot holes at your marks. 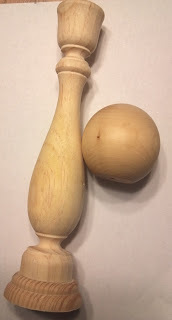 I recommend going in the full length of the screw portion of the hook because the wooden ball is really hard. I didn't make my holes big enough the first time and ended up breaking some of the hooks, they twisted right in half. Put one hook in each hole. Now you're ready to hang necklaces and bracelets on it. I like hanging them up, so they're less likely to get knotted. I couldn't find another candlestick that was the same height as the first one so they're two different heights. Taller would be better so you can hang longer necklaces.